Trump calls Las Vegas shooting an "act of pure evil"
President Trump delivered remarks at the White House on Monday following a deadly mass shooting in Las Vegas, Nevada, late Sunday night, calling the shooting an "act of pure evil" and condemning the shooter as a murderer. "My fellow Americans, we are joined together today in sadness, shock and grief," said Mr. Trump. He added, "I know we are searching for some kind of meaning the chaos, some kind of light in the darkness, the answers do not come easy," says Mr. Trump. A measured President Trump quoted biblical passages and said that he, along with the first lady, prayed for the nation to "find unity and peace." He also took the moment to announce that he would be visiting Las Vegas on Wednesday to meet with families of victims of the shooting as well as first responders, whom he praised for their "miraculous" speed for preventing further loss of life. Along with his scheduled visit, the president also announced that he ordered the flags flying at the White House to be flown at half staff "in memory of the fallen." In a statement released after his remarks, the White House said flags would be ordered half-staff across all government buildings, military posts and embassies until October 6th. He is also expected to lead a moment of silence on the White House South Lawn Monday afternoon. Later at an event to welcome Thailand's Prime Minister to the White House, Mr. Trump called the shooting a "very, very sad moment for me." "No matter where you are – no matter what your thought process, this is a very sad day," he added. Earlier on Monday, Mr. Trump shared his "warmest condolences" with those impacted by the "terrible Las Vegas shooting" in a tweet. First Lady Melania Trump, Mr. Trump's eldest daughter Ivanka Trump and son Donald Trump Jr. also echoed those concerns, tweeting separately of their payers and thoughts for the shooting victims. Paddock, perched high on the 32nd floor of a Las Vegas Strip casino, unleashed a shower of bullets down on an outdoor country music festival below, killing at least 59 people and wounding more than 500 as tens of thousands of frantic concert-goers screamed and ran for their lives, officials said Monday. It was the deadliest mass shooting in modern U.S. history. Paddock, 64, was found dead at the scene. A motive was not immediately known. In a statement released by the Department of Homeland Security, the Department said, "At this time, we have no information to indicate a specific credible threat involving other public venues in the country." The statement added that "increased security in and around public places and events may be experienced as officials take additional precautions." The president was briefed on the shooting earlier Monday morning by Chief of Staff John Kelly and the FBI is now assisting with local police officials in the area. Mr. Trump was scheduled to lead a "deregulation summit" on cutting governmental red tape at the White House on Monday, as well as a meeting with Thailand's Prime Minister Prayut Chan-o-cha. He is also set to host a dinner with Republican members of Congress at the White House later this evening. "May God bless the souls of the lives of the souls that are loss, may God give us the grace of healing and may God provide the grieving families with strength to carry on." The president ends his brief remarks and leaves the Diplomatic Room after calling for the country to come together in prayer and peace. Mr. Trump announces he will visit with first responders and families in the region this week. He says in moments of tragedy, "America comes together as one and it always has." "I know we are searching for some kind of meaning the chaos, some kind of light in the darkness, the answers do not come easy," says Mr. Trump. Trump says of victims families: "We can not fathom their pain"
"We are praying for you and we are here for you and we ask God to help see you through this very dark period," Mr. Trump said to family members of victims of the shooting. 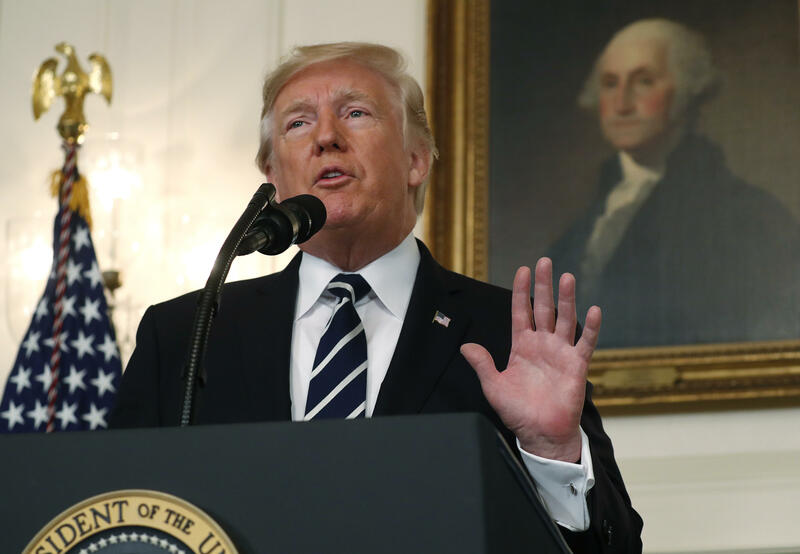 Trump says Las Vegas shooting an "Act of pure evil"
Trump addresses the press for his first public remarks since the deadly shooting unfolded, saying the country is joining together in "sadness, shock and grief." A measured Trump denounced the shooter as a "murderer." He thanked first responders for saving the lives of so many, crediting the speed with which they acted as preventing further loss of life. The president is set to deliver remarks to the press in the Diplomatic Room of the White House for the first time since the shooting in Las Vegas. He tweeted Monday morning offering his condolences to the victims. The shooting left 58 dead and hundreds hospitalized.